TCC built and lined evaporation ponds F & G at the Solana Solar Plant in Gila Bend, AZ. Project included 73,400 cy of excavation, processing and placing SS-13, installation of LCRS collection piping and prep work for placement of liner. TCC moved over 2.6 million cubic yards of material to construct a 300 acre evaporation pond for the Palo Verde Nuclear Generating Station. 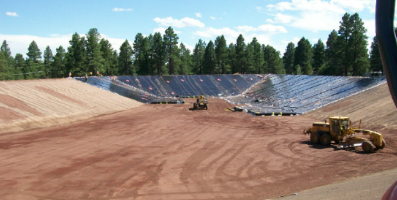 This project included soil cement at slopes, leak detection piping, and grading and prep for new liner installation. Excavating, lining and piping of a new effluent pont for Forest Highlands. TCC moved over 1.8 million cubic yards of material to mitigate potential flooding issues at the Palo Verde Nuclear Generating Station. We started this project on 7/30/12 and worked 24/7 and completed the project on 10/12/12, nearly a month ahead of schedule and within budget. This project was an example of teamwork, partnering and cooperation with all involved.